Granite at prices you can work with processed in India, Italy and China. For five decades we have been producing granite slabs with a variety of finishes and thicknesses for cladding or flooring dimensioned to your requirements, random slabs or paving for large exterior projects. We have two processing plants in India, one near to Chennai and the other close to Bengaluru (Bangalore). 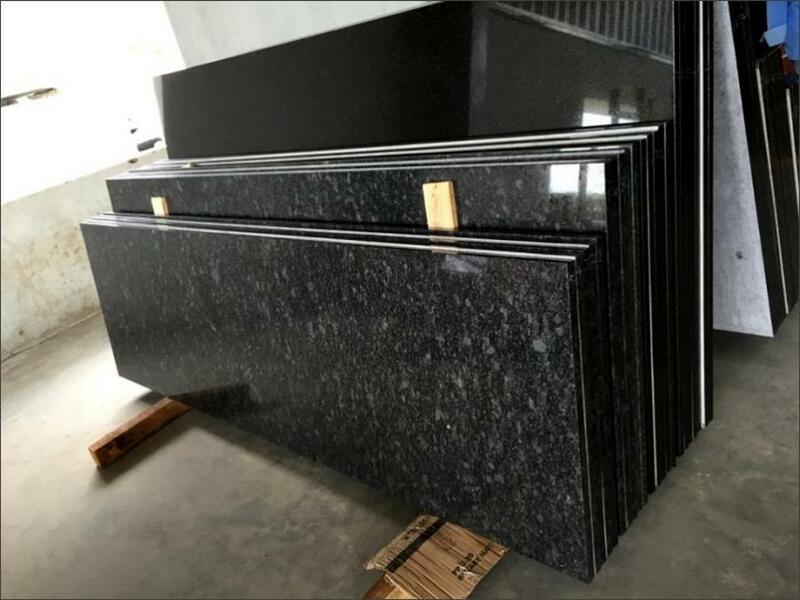 From the mid-1990s we have also had a close association with one of China's leading processors near to Xiamen from where we can supply both local & imported granites as shown on our granite pages. Since the mid 1970s we have had continuing long-term working relationships with several of Carrara's (Italy) world-renown specialist factories. We have many different granite surface finishes suitable for all commercial & domestic projects. You can view two inspection videos at our Indian factory of Absolute Black & Black Galaxy granite slabs. Our Pedrini granite tile line was commissioned in the early 1980s and was the first successful volume production Indian granite tile factory. With a monthly capacity in excess of 10,000 square metres, we are able to supply premium quality granite tiles for all projects. Our granites are only supplied in Full Container Loads (FCLs) however the tile sizes may be mixed to suit your project requirements. Various surface finishes are produced including high gloss, honed, leather, river washed, flamed or brushed. Much more information is available here. Non-Indian granite colours are processed by our partner factory in Xiamen, China, pricing may be requested via our Contact Page. We have been producing granite countertops since the early 1990s and were most probably the first Indian granite company to do so. For the supply of non-Indian granite colours shown on our granite samples page, since the late 1990s we have had a tie-up with one of Xiamen's leading quality granite producers who can supply many different materials, limestone, marble, sandstone, slate & travertine, please request prices via our Contact Page. Are you considering a "black" granite countertop? Here are some Facts to consider about your Absolute Black Granite countertops purchase. Are you wondering what is the difference, if any, between bespoke and prefabricated granite countertops? A stunning and stylish black granite kitchen provides elegance and adds value. Details about Full Container Loads (FCLs) of prefabricated granite countertops are available in most Indian granite colours. We always recommend a factory inspection visit either to Chennai or Xiamen to scrutinise our extremely high levels of production quality. We have been one of India's largest granite memorial manufacturers for five decades and especially so for our Absolute Black Granite. We have been producing and exporting traditional and individually created memorials to wholesale importers globally since 1970 and have a dedicated website where you can view some of the designs we are entrusted to create. Each memorial we create is individual and our time-served masonry craftsmen can create an enduring tribute for your loved one using the finest quality Indian granite from our own quarries. Many different shapes and designs can be created to your specification and budget or choose from our selection of classic memorial production. If you cannot see what you require please do not hesitate to Contact Us. Over the years we have been involved with many projects using various granites such as Japan's Haneda airport shown here using our own TJI Red granite. It is quite normal for us to sign an NDA (Non-Disclosure Agreement) should one be required. Our tie-up with China allows us the huge scope to offer alternative natural stone products to complement the already wide range of granites we can supply. We have a dedicated webiste for those requiring Indian rough granite blocks. All quarries are either owned by ourselves or leased directly from the Government and are staffed by our own skilled personnel including highly-qualified geologists who are used to working to the exacting international standards expected by our customers from many different countries. Our large-scale production capacity with strict standards enables us to provide blocks of uniform colour at the required size ensuring the processor maximum yield from each granite block together with unsurpassed quality for projects of all sizes.